Super Sunday? You bet it is! 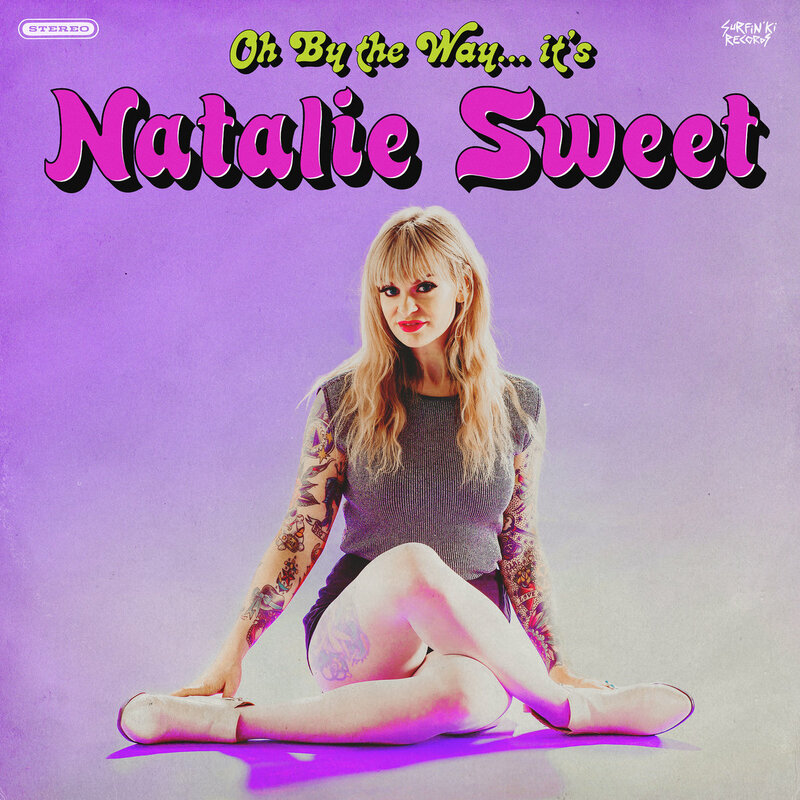 When Travis Ramin described Natalie Sweet's solo debut as a "slammin' power pop album somewhere between Rocket To Russia and Parallel Lines", you had to know my ears perked up! Especially given my fondness for Sweet's past musical endeavors and all of Ramin's productions, I knew this was something I needed to hear. Yet not even that kind of build-up could have prepared me for the OH MY GOD! moment of actually hearing this record. My jaw dropped to the floor within the first 30 seconds of the opening track. Soon I was dancing around my basement in joyful celebration. The whole album left me feeling like a little kid on Christmas morning. If I could have dreamed up the perfect power pop album and had an unlimited budget to hire the best people to make it happen, I still couldn't have topped this. I was a big fan of Natalie Sweet's previous band The Shanghais, and I was kind of bummed that that they were no more. Thankfully Sweet's solo debut retains a lot of the qualities of The Shanghais (and some of the songs as well). For this solo release, Sweet has assembled a veritable power pop/punk all-star team. Ramin produces and plays drums, Morten freaking Henriksen (!) plays guitar, and Devin Clark Jorgenson (Color TV) plays bass. Sweet, so impressive as a snotty punk vocalist on the Control Freaks album, returns to a more pure singing style on this release. She's really the perfect singer for this kind of music. A la a Debbie Harry or Holly Beth Vincent, she's the ideal combination of tough, tender, and just straight-up cool. You believe her tales of heartbreak, and you want to join her when she's out there having fun. Her collaboration with Ramin on this project is so strong that you can hear both of their signature styles all over this record. And that's no surprise considering their long friendship and many shared influences (new wave power pop, girl groups, '50s doo-wop and rock n' roll, the Ramones). Comparisons to previous Ramin productions like Candygirl and Tina and the Total Babes are not unwarranted, yet this could equally be described as the great Shanghais full-length that never was. Production-wise, this album sounds like a million bucks (although I feel like that number may need to be adjusted for inflation). It is tailor made for radio airplay, or at least radio airplay in 1980. Seriously: are those backing vocals not to die for?! Kicking off with the best new wave pop song in decades, "Lip Service", Natalie Sweet's debut album is a must-own item for any fan of punky power pop. Shanghais fans will recognize "Good Love", which has been given the old TravoRamo makeover for this release. I'm usually not one for trying to fix what isn't broken, but damn if they didn't find a way to make this song even better! "I Still Want You" exquisitely channels the pure pop side of the Ramones (Dare I say more Road To Ruin than Rocket To Russia?). "I Don't Want To Need You (Tonight)" takes on the always welcomed Shangri-Las gone punk theme and totally knocks it out of the park. "Do The Shanghai" would not sound out of place on the Nikki and the Corvettes album. "Pizza Man" is a cover from National Lampoon's Lemmings (penned by Christopher Guest!). Yet in the hands of Sweet, Ramin, and co., this song doesn't mock the silliness of '50s teen tragedy songs so much as it fully embraces it. Is it too early to hand Natalie Sweet album of the year for 2019?! This one's gonna be hard to beat! Probably the only person who freaked out more than me upon hearing this album was Carlo from Surfin' Ki Records. So it's hardly a surprise that Surfin' Ki will be releasing it on vinyl. The CD is coming out in Japan on the legendary Wizzard In Vinyl - rebooting a label that has been inactive for over a decade! Pop people, rejoice!